The missing fat you need to survive. As I often say, food is information, not just calories. Food influences gene function, hormones, your immune system and even your gut flora. Literally, food controls every function within your body. This is especially true with the omega-3 fatty acids found in foods like wild fish, flaxseeds, and walnuts. These fatty acids play critical roles in cognitive development and learning, visual development, immune strength, fighting inflammation, pregnancy, brain health, and preventing Alzheimer’s disease, heart disease, cancer, mental illness and so much more. They affect every one of your hundred trillion cell membranes. Makes sense how not getting sufficient amounts of these crucial fatty acids can profoundly affect your health. Do Omega 6 Fats Make Us Depressed and Violent? At a nutrition conference once, I heard Dr. Joseph Hibbeln, the scientist in nutritional neurosciences at the National Institutes of Health, present some startling data about how omega 3 fats impact mental health. Dr. Hibbeln said soy oils and seed oils contain high amounts of inflammatory linoleic acid that create inflammation and disease. In Japan, that number is reversed: 80 percent of their fats come from EPA, while only 20 percent are inflammatory omega 6 fats. Over the last century in the U.S., we have witnessed a 1,000-fold increase in soy oil consumption. About 10 to 20 percent of our calories come from soybean oil rather than omega 3 fats and other, healthier fats we should be consuming. The omega 6 fats aren’t the ones our ancestors ate. Human evolution occurred in an environment where seafood and wild animal fat was the predominant source of dietary fat. Our hunter-gatherer ancestors ate no seed oils. Obviously, they weren’t eating French fries, donuts and the zillion Frankenfoods products that contain these oils. These refined oils create and exacerbate inflammation, which contributes to nearly every disease and makes us fat. Beyond that, the repercussions are dramatic and far-reaching. Disturbing recent research shows homicide in the United Kingdom increased dramatically with increased consumption of linoleic acid-rich soybean oil. The same thing happened in the United States, Australia, Canada and Argentina. Interestingly, homicide mortality rates become inversely related to seafood consumption, meaning societies who eat more seafood have lower homicide rates. Equally dramatic, one study published in the British Journal of Psychiatry gave one prison group recommended daily amounts of vitamins, minerals and omega 3 fats, while the other group maintained their regular diet and lifestyle. Researchers found reduced felony level violent offenses among prisoners who took omega 3 supplements. In fact, providing vitamin and fish oil supplements reduced felony-related violent crime among the prisoners by 37 percent. The Cure for Depression, ADD and Dementia – Is it More Fat? More fat to cure brain maladies makes sense when you consider omega 3 fats affect how we think and behave. Research even shows omega 3s help treat depression, including postpartum depression. The omega 3 docosahexaenoic acid (DHA), a critical part of mother’s milk, helps the fetus’ neurologic development. Studies show women who have higher levels of omega 3 fats, specifically DHA, have lower rates of postpartum depression. Omega 3 deficiencies also affect our children. Young kids with dyslexia, dyspraxia (difficulty writing), learning disabilities and attention deficit disorder (ADD) are often omega 3 deficient. The neurotransmitter dopamine, critical for brain function in children, becomes higher when these children consume essential fatty acids. Controlled studies show fish oil improves reading, spelling and conduct because the nervous system depends on these fats to function. I could go on, but I hope you understand evidence overwhelmingly supports that omega3 fats are critical to improve mood, mental functioning, metabolism and so much more. If you’re curious to learn more, please check out my newly released cookbook Eat Fat, Get Thin, in which I show you how to effortlessly incorporate more omega 3s and other healthy fats to lose weight and get healthy. The morning of my book’s release I felt like a little boy on Christmas morning. Thankfully, emerging research proves how vital healthy fats are. The outdated “eating fat makes you fat” paradigm has shifted to a new, more accurate understanding of dietary fat as evidence shows some fats are essential for optimal health. Chronic disease will only increase as we move further away from the diet of our ancestors, which consisted of omega 3 rich protein (wild, grass-fed animals and wild fish), a healthy ratio of omega 3 to omega 6 fats, and mostly plant foods. We’ve gone way off course with the way our ancestors ate. Big food companies have hijacked our taste buds and our biology. Yet there’s hope. Science shows when you eat the right kinds of fat, you get thin, decrease inflammation and reverse heart disease, type 2 diabetes, and many of the other chronic diseases that plague us. You can take control of your health and destiny, starting with your very next meal! Sugar, not fat, makes you fat. Sugar spikes insulin – the fat fertilizer hormone laying the foundation for belly fat. Sugar also slows your metabolism and is addictive and makes you hungry (all the time!). Fat actually speeds up metabolism, cuts hunger and increases fat burning. Boy, did we get this wrong during the low-fat diet era! Dietary fat is very complex. We have saturated, monounsaturated, polyunsaturated and trans fats. And we have subcategories within each group. Some fats are good and yes, some are bad. Remember that quality matters; that food is information. Low-fat diets claim to be heart-healthy but aren’t. Low-fat diets typically tend to be higher in sugar. Eating less fat and more sugar and refined carbs floods our system with insulin, creating inflammation, heart disease and many other problems. When you consume lots of sugar and refined carbs, your body produces dangerous, artery-clogging small, dense LDL cholesterol particles; drops your protective HDL and increases harmful triglycerides. That’s a bad combo just begging to bring on a heart. Saturated fat is not a “bad” fat. A review of all the research on saturated fat published in the American Journal of Clinical Nutrition found no correlation between saturated fat and heart disease. I am not advising eating sticks of butter every day; however, saturated fat is not the boogeyman we once thought. The problem arises when we eat them with sugar and starch (sugar, flour, white rice and potatoes), because then they are deadly. Basically, think no sweet fat. Some fats are unhealthy. Trans fats and inflammatory vegetable oils are bad fats that cause free radical damage and create a perfect storm for inflammation. Most restaurants cook with toxic oils because they’re cheap and marketed as heart-healthy, low-cholesterol fats. We all need more omega 3 fats. Most Americans are deficient in these health-crucial fats. The best ways to include them in your diet are to include wild or sustainably raised cold-water fish and pastured or omega 3 eggs, and taking a quality, toxin-free omega 3 fish oil like Arctic Cod Liver Oil by Nordic Naturals Pro. Eating fat makes you lean. The right fats can nourish your cells to better utilize insulin. Healthy fats also help to stop your cravings, curb your hunger and reset your hormones to help your body burn fat more efficiently. Your brain is made up of mostly fat. About 60 percent of your brain is fat, mostly as DHA, which your cells need to communicate. Quality omega-3 fats improve cognition, memory and mood. Research shows omega 3 deficiencies increase depression, anxiety, Alzheimer’s and bipolar disorder. To get and stay healthy, eat quality fat at every meal. The right fats improve your skin, hair, nails and mood. They protect against type 2 diabetes, dementia, cancer and inflammation. Extra-virgin coconut butter, which is a great plant-based source of saturated fat that fuels your mitochondria, is anti-inflammatory and helps optimize cholesterol. Simply put, a quality fat, whole-food diet that is lower in refined carbohydrates, low-glycemic and high in fiber is the best medicine to keep you lean and healthy. Dr. Mark Hyman is the Medical Director at Cleveland Clinic’s Center for Functional Medicine, the Founder of The UltraWellness Center, regular contributor to the Today show, Good Morning America, and The Dr. Oz Show, and a ten-time #1 New York Times Bestselling author. He is helping people lose stubborn weight with his book Eat Fat, Get Thin: Why the Fat We Eat Is the Key to Sustained Weight Loss and Vibrant Health. READ NEXT: What if the cure for depression is outside your brain? 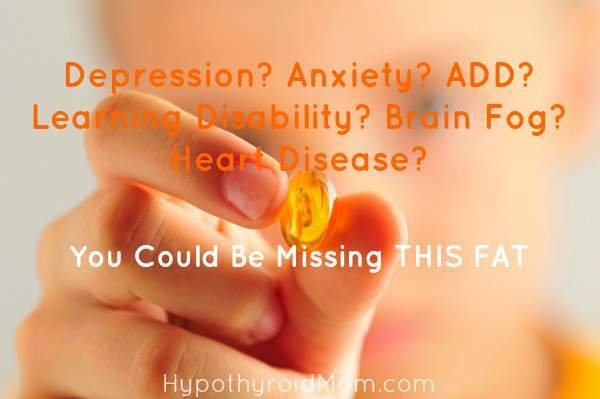 There is evidence that if it is caught early enough by someone who is not actually make a life long paycheck out of you, that it can be healed by using natural thyroid for a short term (4 6 weeks) and supporting the adrenals while a sluggish thyroid heals. Like all health problems is is inflammation based and requires diet and lifestyle changes. Allopathics approach to life, is to kill everything- so RAI that destroys the master gland of the body leaving people to become “patients” for life who are used to cross refer to others (shrinks) to address the normal sequala of thyroid symptoms that are not addressed with substandard synthetic hormone replacement. And they all get to make money while we suffer. I regret going to an Allopathic practitioner every day of my life. Although the research is clear, that vital life sustaining nutrients are essential to good health, it is both unethical and misleading to state/label/misdiagnose a lack of vital nutrients as if it is a “mental illness”. So although access to proper nutrition can eliminate the symptoms being labeled as ‘mental illness”, it is critical that these practitioners start being honest about what is being “treated” here. The National Institute of Mental Health (NIMH) withdrew all funding for the DSM5 owing to a complete lack of scientific validity, forcing the American Psychiatric Association (APA) to fund this erroneously positioned “disease” model of “mental health” themselves, which should have lead to the DSM being taken OFF the market because misdiagnosis is medical malpractice. And yet, this junk science continues to be used to misdiagnose, drug, addict, disable and kill millions of innocent people. Anyone who supports the pathologizing of children as having specious “mental health” issues when in fact the root problem causing them to present with these symptoms (which are not diseases in and of themselves) because they are deficient in the proper kinds of fats or other vital nutrients (or they have an un/misdiagnosed autoimmune disease) is guilty of medical malpractice and insurance fraud. Unless and until alternative and “integrative” practitioners stop supporting DSM labels for children (or anyone) suffering from nutritional based health problem, they are simply adding to false pathologizing of children. “Mental illness” labels are for LIFE and come with very serious consequences even if a child is spared being drugged with neurotoxins. Lets be honest, vitamin deficiencies are vitamin deficiencies; they are NOT ‘mental illness’s”. Half a truth is still a lie and a lie is a lie, no matter whose telling it.